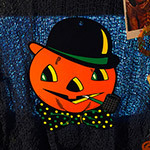 The 2012 Halloween Mood Table! | Dinosaur Dracula! The Halloween season is officially here. There’s exactly one month to soak up everything it has to offer. 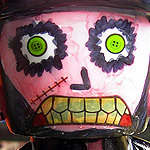 Strange candy, hayrides, and masks that smell like toxic chemicals. Even the gloomiest mofos would have to admit that October is one of the most bearable months of the year. 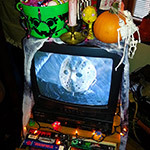 Since it’s October 1st, it’s of course time for THE HALLOWEEN MOOD TABLE. If you’re a new reader: This tradition began on X-Entertainment, back in 2007. That was not a terrific year for me, and in fact, it was the only year I ever outright canceled the Halloween Countdown. Among other issues, my usual spirit just wasn’t there. In a desperate attempt to remember why I loved Halloween so much, I started decorating a small table. I covered this table with happy, haunted things. When it was finished, I saw a miracle. In at least one corner of one room, everything was right with the world. 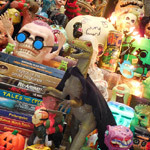 Every year since, I’ve made – and written about – a Halloween Mood Table. No two have looked remotely alike, but they all served the same grand purpose. It’s such an easy thing to do, and it goes so far in making your October feel like October. Bam. 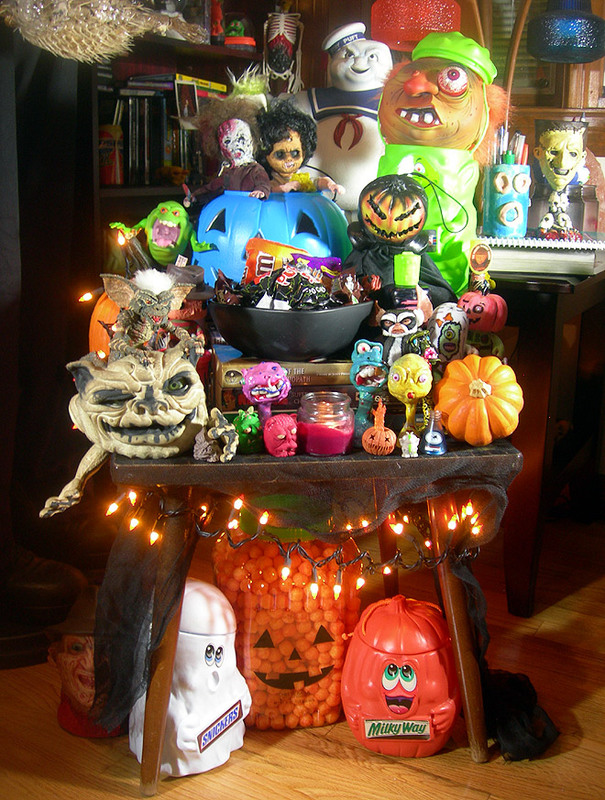 A table covered with Halloween wonders, absolutely guaranteed to make every day better. Until November, at least. 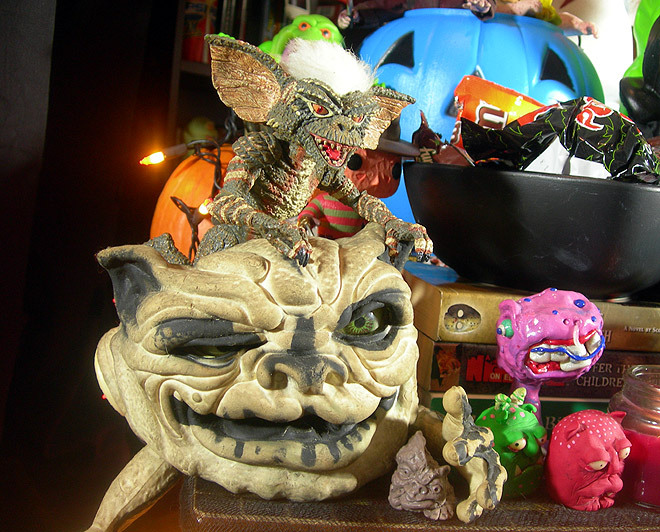 There’s no way to make a bad Halloween Mood Table. You’re only doing it wrong if you’re not making it for yourself. Hell, you don’t even have to use a real table. Make a Halloween Mood Chair, I don’t care. 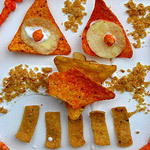 The idea is to give your home at least one small area where Halloween reigns supreme. 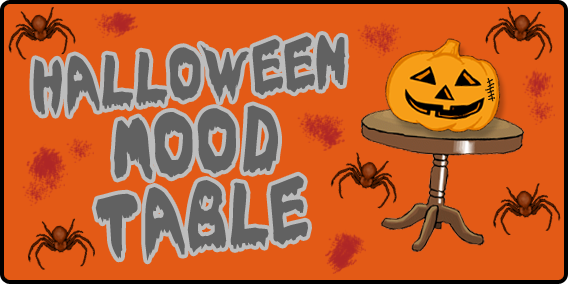 On those dark days when October feels no better than any other month, your Mood Table will remind you that it is. The best thing about Halloween is its ability to transform even the most mundane activity into bloodcurdling joy, and your Mood Table will constantly encourage you to make the best haunted lemonade you can. 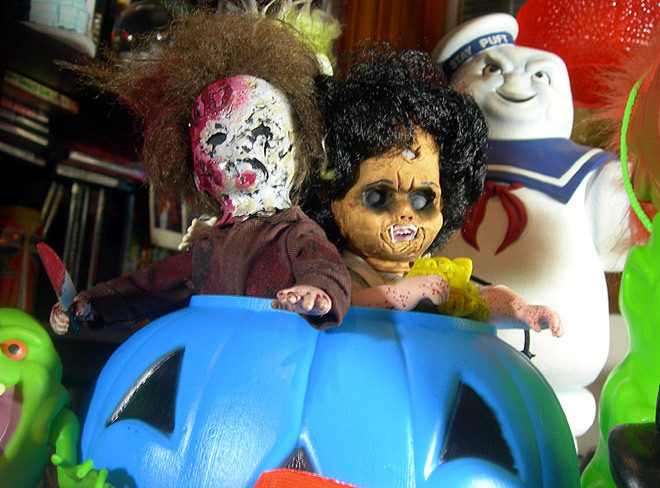 I don’t want to dictate what your Halloween Mood Table should include, but I gotta give you this one tip. Even if a nice visual is the important point, I also like to stuff my Mood Tables with things to do. Scary books, scary DVDs and so on. It’s hard to tell by the photo, but there’s plenty of “things to do” on my Mood Table. You can turn it into a personal challenge. If there’s a book or a movie resting on there, you have to read or watch it by Halloween. This can turn even the most boring night into a fun-filled doom quest. I also recommend adding a bowl of candy. 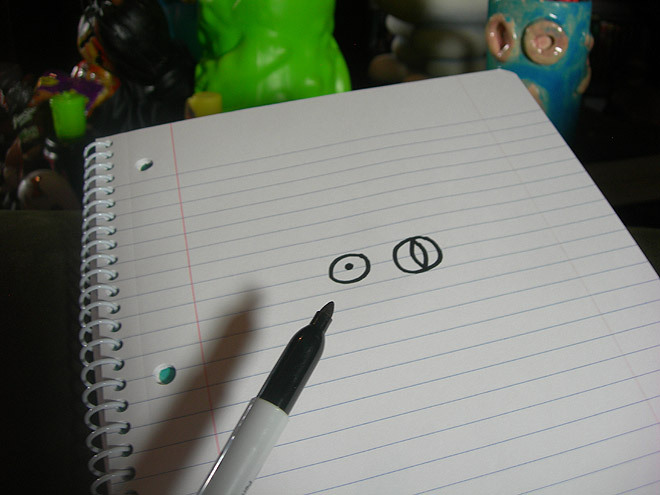 If you’re reading this, you’re probably too old to go trick-or-treating. 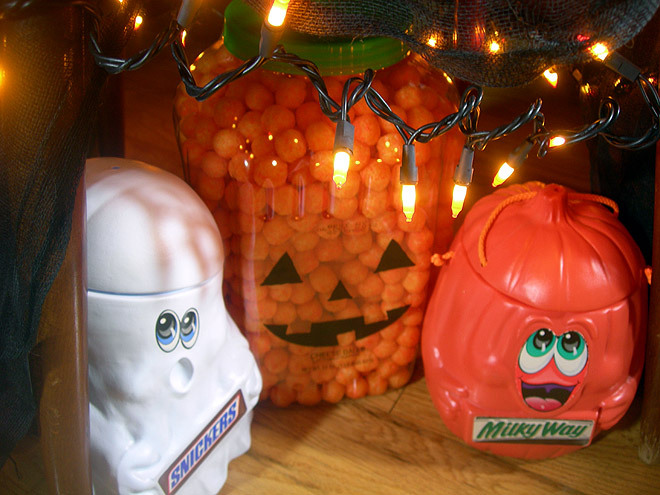 That candy bowl can be like, your version of it. A bad movie, a popcorn ball, and a weird blue jack o’ lantern staring at me from the distance. Thank you, Mood Table. I couldn’t handle another normal Monday. Notice how I hid an enormous jar of cheese balls under my Mood Table? That’s for our As Of Yet Undetermined Party Night. Hey, I make these Mood Tables for me, but there’s no reason I can’t impress my friends with it, too. 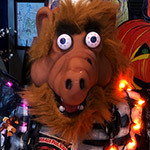 Just wait until they see me yank a jack ‘o jar filled with ten thousand cheese balls from under this table d’art. I foresee applause! This year, I added a new thing to my Mood Table. Actually, I added a new thing to the table behind my Mood Table, because space is finite. My Mood Table is slowly spreading outward, like a virus. Finally, a disease worth catching. I can’t wait to see what it does to my couch. 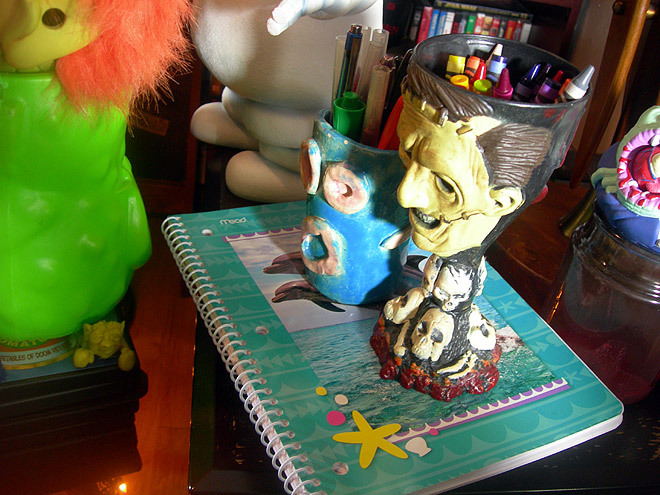 Anyway, it’s a spiral notebook, along with a crayon-stuffed Leatherface goblet, along with some horrible ceramic mug that I made in the seventh grade, filled with markers. 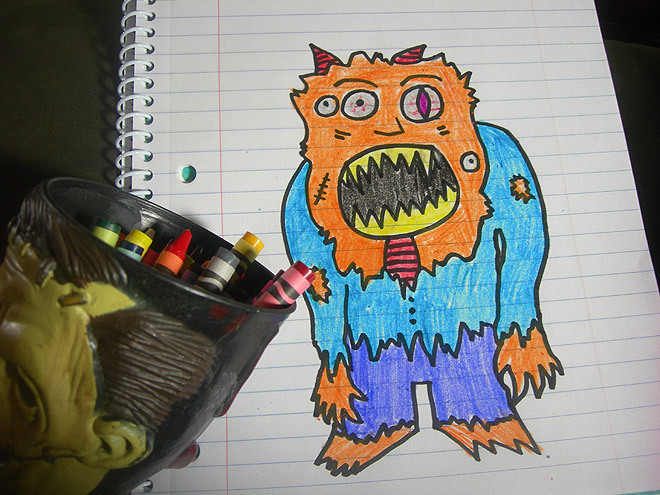 The goal is to color the book’s pages with as many ridiculous monsters as I can. I don’t expect to do this every day, but even if I only do it for three, those are going to be three great days. His name is John Kenno. 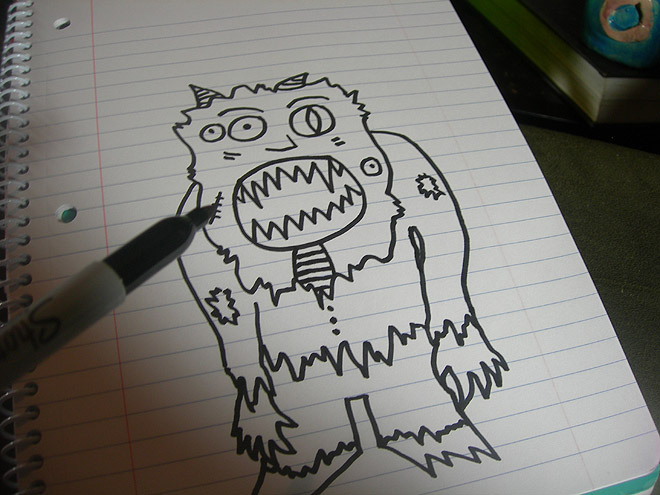 I know it doesn’t sound like a “scary monster” name, but there’s a reason for that. John Kenno was once a normal human being. After paging through a dusty old spellbook and carelessly reading its words aloud, everything changed. Page 26 only made it thunderstorm, but page 27 turned him into this. John Kenno is not pleased, but I don’t think he’s yet considered the benefits of having four eyes. See ya later. 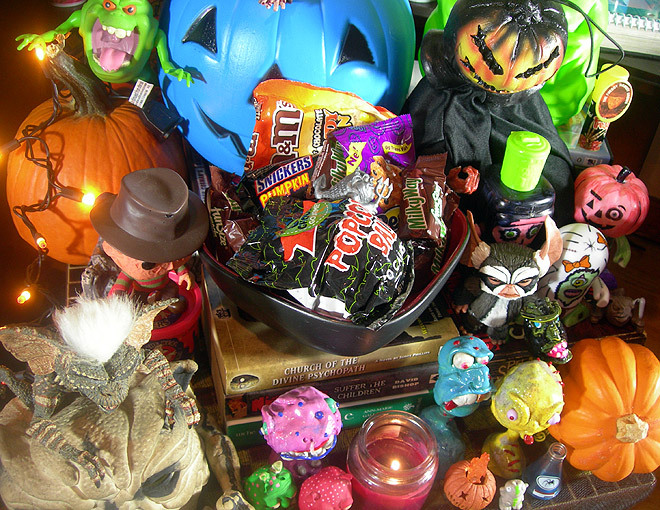 Make your October great…even if all you do is decorate a tiny table with candy and action figures.